"How to Perform Static Testing to Increase Return On Investment"
Static testing is an option too often overlooked as only one quarter of US companies are engaged in it. But what they fail to recognize is that the return on that investment from static testing is far higher than any money presumably saved by not utilizing it. In comparison with traditional testing processes, static testing tops the charts with certain key features like. 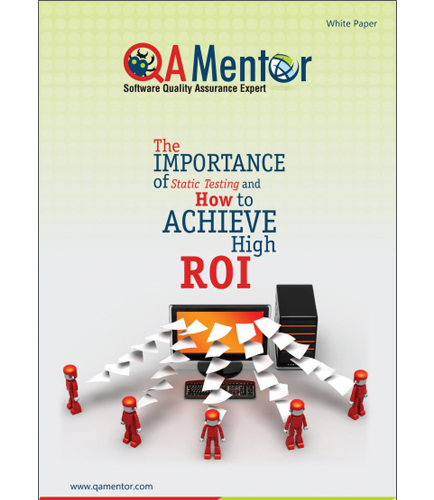 Reduces testing costs to a bargain of potential expenditures, maximizing ROI. Much earlier defects detection, thereby making way to faster fixes. Many times more effective than dynamic testing. This white paper elaborates the static testing processes by following a strong and proven methodology which includes. Reviewing the design of application completely with the help of a thorough inspection process. Performing a walkthrough to ensure Business and industry standards are evaluated properly. Why static testing is a necessary step for any organization wishing to increase the quality of their products and to increase the Return of Investment? How to perform static testing the right way? What are the benefits of Static Testing and how to reap them? How to use static testing techniques to reduce the testing time and increase ROI?